Nichola de la Haye is one of those very rare women in English history. She is renowned for her abilities, rather than her family and connections. In a time when men fought and women stayed home, Nichola de la Haye held Lincoln Castle against all-comers. The eldest daughter and co-heiress of Richard de la Haye and his wife, Matilda de Verdun, she was probably born in the early 1150s. Richard de la Haye was a minor Lincolnshire lord; in 1166 he was recorded as owing 20 knights’ fees, which had been reduced to 16 by 1172. 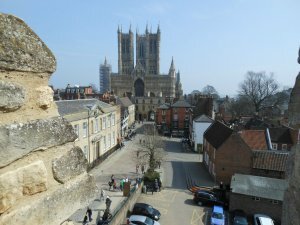 When he died in 1169, Nichola inherited her father’s land in Lincolnshire and his position as castellan of Lincoln Castle, a position she would hold for over 30 years.